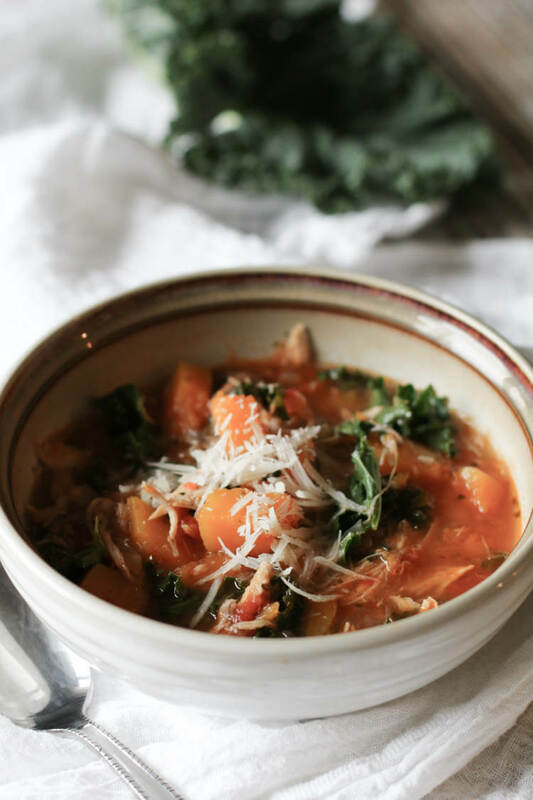 Tuscan Kale, Squash and Chicken Stew is rich in nutrition from bone broth, low-carb vegetables and leftover roast chicken. 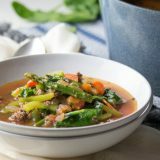 This Instant Pot meal is a soothing, light yet hearty stew and makes a great 30-minute meal. Stews are a great way to use up the last of the winter squashes. Butternut squash, in particular, is an ideal candidate for stews. 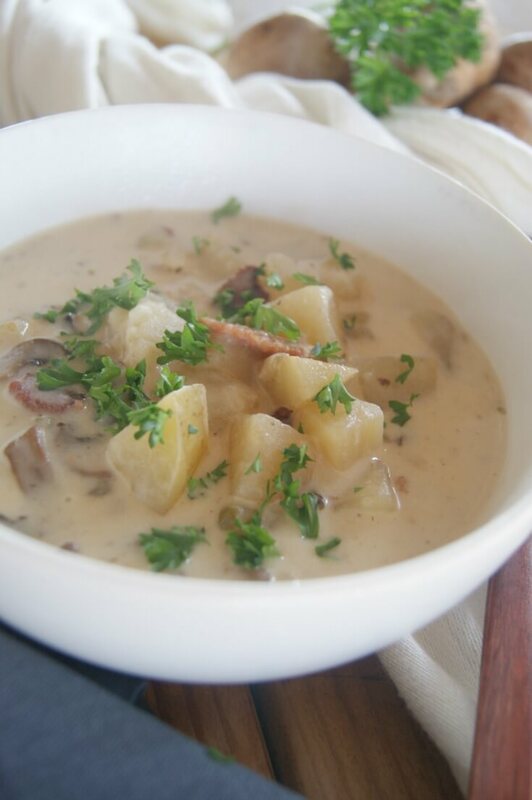 It cooks down to perfect consistency and adds loads of flavor in a dish. It doesn’t hurt that they are lower in carbs than other vegetables typically used in stews such as potatoes. 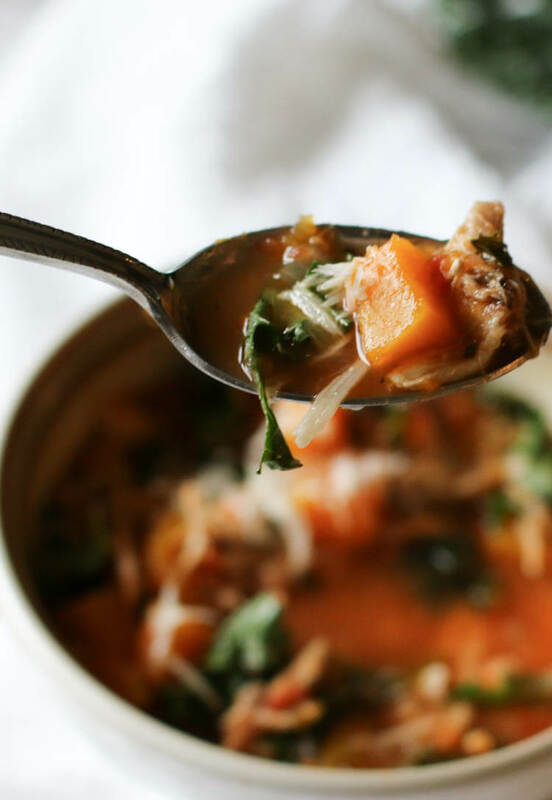 Even though butternut squash still contains carbs, the amount you would eat in a serving of this soup is still relatively small compared to other high carb vegetables. 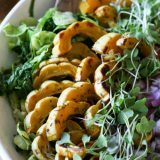 A small butternut squash as used in this recipe would make 2 cups of diced squash. That makes about 1/4 cup of squash per serving or 5-6 grams of carbohydrates. 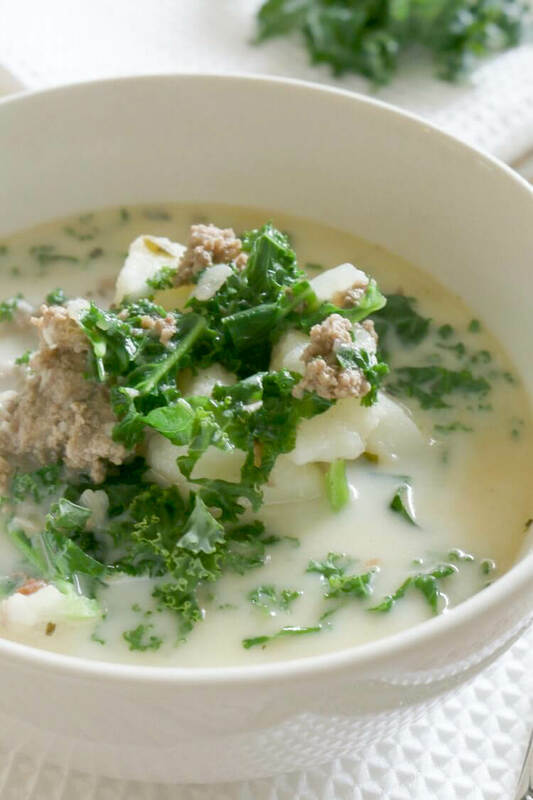 The easiest part about this recipe is 2 of the biggest protein-rich ingredients are already pre-cooked: chicken and bone broth. Use whatever leftover chicken you have. I routinely roast 2 chicken fryers in the oven so it’s common for me to have plenty roast chicken in the refrigerator for quick salads and easy soups. If you don’t have leftover chicken, you can easily make some shredded chicken in the Instant Pot in advance. Even grilled chicken would be great in this recipe. Because the chicken is cooked, it needs to be added towards the very end and then just use the “saute” function to bring everything to warm temperature. Bone broth can be either store-bought or made at home. Find out how to make bone broth easily using any of the three methods (stove top, slow cooker, or Instant Pot). 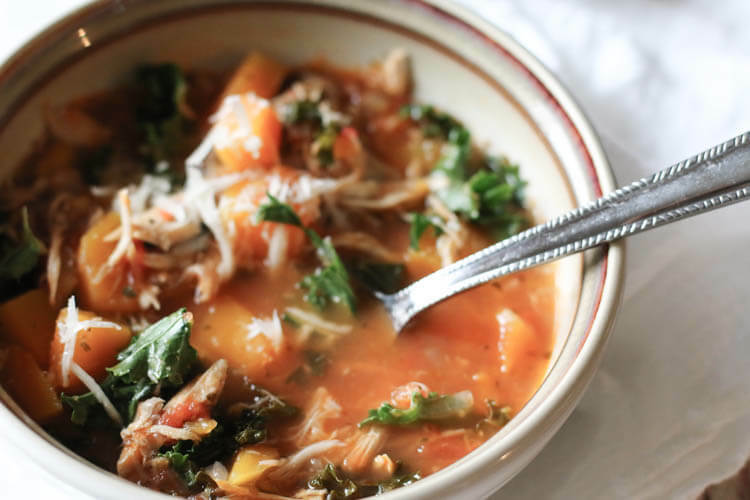 The versatility of this soup gives freedom to use whatever kale, squash and chicken you have. I used garden fresh curly kale but I imagine lacinto kale would be just as delicious. Likewise, spinach would do in a pinch. Diced tomatoes add more flavor and texture. I prefer to use tomato products in glass jars (versus BPA lined cans) and usually stock up on these Jovial Diced Tomatoes when they go on sale. I love that the only ingredients are tomatoes and tomato puree. Please note that the glass jars do run a little larger (18.3 oz) than the typical can size of 14.5 oz but that’s a hardly noticeable difference. Feel free to use what you are most comfortable with and what you have in your pantry. Italian Seasoning can either be store-bought or mixed at home. 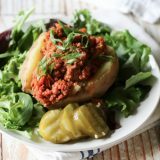 I use recipe in this post (which is also one of my first posts on P&N). If you don’t have either, simply combine equal amounts of basil, oregano, thyme and rosemary to make a total of 2 tablespoons. This brand of Italian Seasoning works great. It’s best to do natural pressure release but if in a rush, feel free to do “QPR” (quick pressure release). Be sure to add the chicken, kale, and lemon at the end and press “saute” for just a few minutes to bring everything to even temperature. Check for salt at the end. Depending on the salt content of the broth used, additional salt amount will vary. Instant Pot – 6qt – Greatest kitchen appliance ever! This stew is easily made in this electric pressure cooker and can be kept warm for later. Diced Tomatoes in Glass Jars – I love Jovial brand of tomato products as they are not only organic but stored in glass jars. Italian Seasoning – this brand is organic and contains no fillers or anti-caking agents. Rich in nutrition from bone broth, low-carb vegetables and leftover roast chicken. 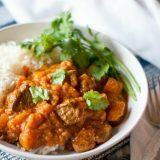 This pressure cooker meal is a soothing, light yet hearty stew and makes a great 30-minute meal. Press "saute" function on Instant Pot. Add cooking fat to melt. Add diced onions and saute until translucent and soft. Add garlic and seasoning and saute for 1 more minute to release flavor. Add diced tomatoes, diced squash, and broth. Close lid, set valve to "sealing" position. Press "manual" and reduce time to 8 minutes. Add cooked chicken and prepared kale. Press "saute" function to bring everything to warm temperature. Check for salt and season as needed. Stir to combine everything Garnish with parmesan cheese, if desired. *If in a rush, you can also do "QPR" (quick pressure release) and proceed as instructed. 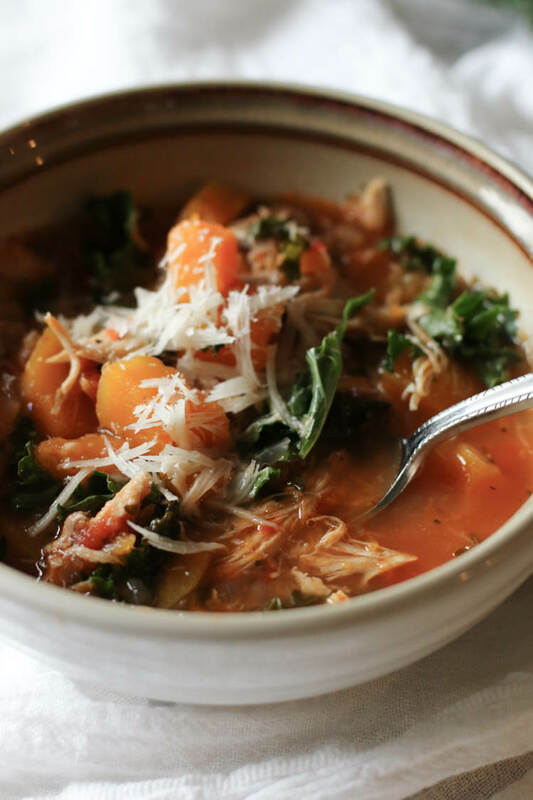 Save this Tuscan Kale, Squash and Chicken Stew to Pinterest. I stumbled upon your blog while doing a search for a kale chicken squash casserole. It’s how I figure out what to cook….Google searches! Since I also make my own bone broth also and had just made some in my IP the morning, I was thrilled to come across this recipe. It will become a regular in my home….SO GOOD! It has gotten better each day, also. I used frozen butternut squash and a rotissiere chicken from Costco and I had a bag of shredded kale, cabbage and Brussels sprouts from Trader Joes’. This was SO easy and worth the repeat, for sure! Thank you Patty for sharing with me. Glad you enjoyed it!